Thank you to all of you who weighed in on my last post about our dilemma. When I wrote that post, we had not yet hit the proverbial wall; I didn’t know the behaviors would get even worse. The first night of the medication —only two doses given at full strength —left Nik in a lethargic zombie-like state the next day; the second night —doses of only half strength— accomplished the aim of uninterrupted sleep and a subsiding of the allergy symptoms but left Nik in an even worse state of hypersensitivity and extreme agitation. We opted to forgo the medication and try to mitigate any allergic response as much as possible using some homeopathic remedies to relieve the symptoms. Now, say what you will about homeopathy —we are all entitled to our opinions —but I have personally experienced times that it works both for me and for Nik. I certainly don’t believe homeopathy —or anything else for that matter— will “cure” my son’s autism (or anything else). What I have seen, though, is that it can ameliorate some specific symptoms of physiological responses and make things a bit better —more manageable, if you will. Such has been the case with the homeopathic antihistamine we’ve used. It’s not perfect and it doesn’t solve the problem by any stretch —Nik’s still showing signs of allergy or extreme sensitivity— but it makes Nik more comfortable and less inclined to claw at his head. And that’s all good. Anyway, we decided Nik in the aftermath of the Atarax was too close to our experience of Nik in the weaning stages with Lamictal. (You may recall that was an ugly time for us.) Nik continues to show us that he does not handle certain types of medications well at all. No amount of titration or even minimal use will work. He has had adverse reactions to four different seizure meds, paradoxical responses to another anti anxiety med plus Benadryl, and now this. At some point, we have to respect the messages he’s giving us. That point is now. Last night, Friday, was our second night without the Atarax. Nik slept okay —not as long as I’d have liked but soundly none the less. This morning, the light is back in his eyes and the music in his voice. As I write in the loft, I can hear Nik playing happily in the family room below; he’s actively engaging with his electronic toys, singing along in time with the music and “talking” back when they make the letter sounds. “Huh” he says when the alphabet train says “This is the letter H.” Instant recall where two days ago there was confusion and extreme frustration at his inability to retrieve the information in his brain. 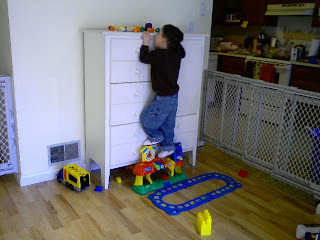 I witnessed the same thing yesterday in his OT session; he couldn’t recall simple things that he’s long ago mastered —this one was matching colors in a sorting activity —and he got so frustrated that he just fell apart. Yet, today he’s able to respond to a disembodied voice from his toy asking him “Where is the letter P?” He recognizes that he has to wait a moment before pressing the right button and he’s actively looking at the letters to find the right one. He even says “guh” for “good” when he knows he’s pressed the right button. He is aware in ways he hasn’t been for a few days. As for me, well, I suppose I’ll just learn to adjust and sleep less. Meanwhile, the payoff of seeing my son back to his normal rascally self is enough to keep me going. Our quest for information and answers continues. Anyone know the zip code for Hell? Twenty-six months since Nik took his first seizure medication. Two years since his once voracious appetite and willingness to eat withered away to nothing. Nothing. Twenty-two months since my child slept peacefully through the night. 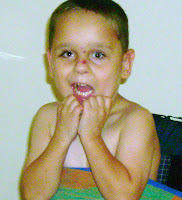 Twenty months of piercing, debilitating pains in his head, ears, eyes, jaw, and stomach. Twenty months of hitting his head so hard he looked like a prize fighter on the losing end of the bout some mornings. Twenty months going from doctor to doctor —in multiple disciplines of medicine —and finding no answers and no solace. Fourteen weeks; the schedule the doctor suggested we follow to wean Nik off the Lamictal. Twenty-five days since we began the weaning process. One day a week in which Niksdad is available to help out due to his school and work schedule. Three and a half hours; the most contiguous hours of sleep I’ve had since mid-August. Zero inches until I reach the end of my emotional rope. Five minutes; the amount of time it took for Niksdad and me to decide we’d rather have a short, hot trip through the center of Hell than a long, slow burn on its outskirts. Six days until Nik takes his last dose. I’ll try to send a postcard, but if you don’t hear from me for a while it’s only because there’s no Internet and no wireless in Hell. But we finally found the road out of town. Nik was awake from midnight until two this morning. PLAYING. It wasn’t exactly the blissful night’s sleep I envisioned when I wrote this post. Still, it wasn’t his usual thrashing, kicking, screaming middle-of-the-night melodrama either. And I didn’t even have to sit with him! I simply promised him I’d be here in the morning and he let me go —with something akin to ease. I’d call that progress in a strange sort of way. While it was an amusing two hours —replete with serenades of laughter, clapping, and songs —it was nice to finally drift off to sleep listening to the quiet stillness of the house. I have to wonder how much of last night’s play-fest was driven by the fact that we never got out of the house due to the weather; Nik didn’t get nearly enough gross motor activity yesterday. The sun is shining today and I’m going to try to get Nik to the park at some point to burn off some of his energy. …but it seems like Nik has hit another plateau with the decrease of his Lamictal. The ear infection is under control —last dose of antibiotic was tonight —and we’ve been giving him acidophilus to help his tummy cope with the the effects of the antibiotics. Last night at bed time, I promised Nik I would be here when he woke; he went to sleep without any fuss —and slept twelve and a half hours straight through the night! Let’s see if he does it again tonight! Tonight’s bedtime was a replay of last night’s smooth operation and he was out cold by 7:30 p.m.